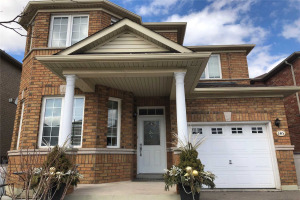 Beautiful Bright Spacious 4 Bedroom Home In Desired Vellore Village. Large Eat-In Kitchen With W/O To Interlock Patio And Fenced Yard. Open Concept Family/Living Room With Hardwood Floors And Corner Gas Fireplace. Main Floor Laundry/Mud Room With Door To Garage. Finished Basement Has A Kitchenette With Sink, And A 3 Pce Bathroom, Additional Wash Tub In Separate Room. New Roof, Air Conditioner, And Furnace In 2017. Freshly Painted. Close To All Amenities.